This holiday is a happy joyous occasion. It celebrates the annual public reading cycle of the Torah coming to an end. Some look at the literal meaning of Simchat Torah as "rejoicing in the Torah" or "rejoicing in the law." (Simchat means to be happy). Simchat usually stands for joy or happiness and reflects the atmosphere that we should feel in our hearts when we finish a cycle of reading the Torah and can begin again. The joy not only comes from finishing the Torah and having a better understanding of God's message, but also in knowing we have the religious freedom to read it again if we choose to. There are times in the Old Testament where someone read all of the words of the Torah. The celebration that comes after is more of a man made holiday than a Biblical holiday. It probably wasn't celebrated as its own holiday until the 9th or 10th century. Simchat Torah is usually celebrated on the 23rd day of Tishri. Today in most Orthodox Synagogues the Torah (Genesis, Exodus, Leviticus, Numbers and Deuteronomy) is read in its entirety on an annual cycle. Starting with Genesis and moving forward through Deuteronomy, weekly portions (chapters) are read. When this cycle comes to an end, there is a celebration because we have finished again. The cycle then immediately starts over with Genesis. Along with the regular weekly Torah portion is also an additional reading from a prophet known as a Haf Torah. These readings follow the Torah cycle also; however, there are some prophets who do not have their prophecies ever read like Isaiah, Chapter 53. In other words, certain chapters from the prophets are read at the same time as certain torah portions to create the annual cycle. These readings are more or less already set as part of the calendar and, in most cases, remain constant from synagogue to synagogue. This holiday is usually celebrated at an evening service at a house of worship, such as a temple or synagogue or temple. Sometimes all of the Torahs are taken out of the ark and carried around. This is known as "Hakafot" or marching around the synagogue or temple. Then all the Torahs are placed back inside of the ark except for three. These bridegroom honors are sometimes reserved for those who make large financial contributions to charity and have invited several guests to a feast after the service (Kitzur Shulhan Arukh 138). Different people get the honor of carrying the torah around that normally wouldn't, such as children. There are extra chances to be called upon to read the torah and say a blessing. This in known as an Aliyah. Sometimes in a congregation each man is called up an given this opportunity. Some children have homemade flags to wave as the torah is carried past them. Candy is passed out, and sometimes there is a light snack for everyone after the service is over. Some congregations allow the wearing of a costume similar to a Purim atmosphere. You might even find some passionate singing with perhaps dancing (even carefully with a torah). Some congregations celebrate Shemini Atzeret (the holiday that is at the end of The Feast Of Tabernacles and Simchat Torah on the same day. Others celebrate them as two separate holidays. When celebrated as two separate holidays, Simchat Torah comes on the next day after Shemini Atzeret. Sometimes in conservative and orthodox congregations, Simchat Torah is viewed as a day that has been added on to Shemini Atzeret. It is then celebrated on the second day of Shemini Atzeret. Today a different Haftorah reading comes with Simchat Torah. It is the first 18 verses from the book of Joshua. This has been the custom even though it contradicts the Talmud. In ancient Israel, it may have taken up to three and a half years to complete one torah cycle. It is, therefore, possible that Simchat Torah celebrations in the past have been observed at different times of the year. There is reported to be a custom from the Babylonian Ge'onim, of reading the first verse of Torah on the afternoon of Yom Kippur. It is because of the following legend. Throughout the Ten Days Of Repentance, Satan has been accusing Israel, arguing "Behold, the Torah which you have bestowed upon Israel- they have already finished with it!" Now, when the Holy One hears them beginning again from Genesis, he immediately rebukes Satan saying, "Look how, as soon as they complete it, they immediately start over again, so great is their love for my Torah!" This is not a fast day because it is a joyous occasion. Some people consider Simchat Torah the last day of the High Holy Days. Children march around as the final passage is being read. Some carry flags as though marching in a parade. Some children even put an apple on top of their flag stick to symbolize a harvest. How wonderful it is, that as our spiritual walk with God grows and we make forward progress, God's word reveals to us more and more of His gracious truths and promises. How wonderful it also is that after the Torah, God sent the prophets to further reveal to us what was later to come in Israel's history. Even more wonderful than that is when the Spirit of God reveals these things to us through spiritual wisdom and understanding. Then we can see God opening His arms wide, waiting to embrace us with His love. Torah reading went from being read only on the sabbath to being read three days a week. It may be because both Mondays and Thursdays were seen as traditional market days, when shoppers would get supplies for the coming week. The idea was the Torah was read on those days, then there would be a greater chance of increased attendance since more people would be in the area. Today many congregations read a short part of the coming weeks chapter on Mondays and Thursdays. To see how the Hebrew scriptures are divided up into annual readings please view the Torah Reading Chart. There are other congregations in the reformed and conservative branches of Judaism that take longer to complete the Torah cycle. Therefore, they do not follow the predetermined reading schedule. The thrill of finishing a Torah reading cycle can only come one day a cycle (usually annually). This is the only time when the torah is read at night. The next major holiday that follows this one is Hanukkah. There is a resemblance between this holiday and a wedding ceremony. Some have compared Simchat Torah to a wedding between Israel and God's laws. Some congregations allow children under the age of 13 to say a blessing over reading the Torah. This would be the only day of the year that would be allowed. Sometimes all the children are gathered together and the blessing from Genesis 48:16 is read by the rabbi. When Simchat Torah is over, it is time to take down the Sukkah and store it away for another year. This holiday celebrates the end of a cycle and the beginning of a similar cycle again. Needless to say, as long as there is an effort to read the Torah from Genesis through Deuteronomy in order, there will be this holiday. It is customary to also read a prophetic passage (Haftorah) along with a Torah portion. Jesus himself took part in this Haftorah reading custom. It is unclear if at the time of His reading from Isaiah, if that was part of a pre-established Torah reading cycle or if He selected the passage to read Himself. Here Jesus is reading a prophetic passage from the Isaiah 61:1-2. The first part of the passage deals with his announcement of His Messiahship. Notice he stops here. The second part of the verse that deals with judgment will be for His second coming. If this was the predetermined cycle of Torah reading and prophets, then God the Father was responsible for the perfect timing of this passage coming up on that weekend when Jesus was worshiping in that synagogue. If Jesus Himself picked the passage, then it is He who is announcing to the world that His Messiahship has begun. On a much deeper basis, our Messiah's death and resurrection fulfills this holiday once and for all. With Him came the new covenant promised in Jer. 31:31, so our cycle of Bible study is expanded. With Him also came the opportunity to live by the Spirit of the law instead of the letter of the law. 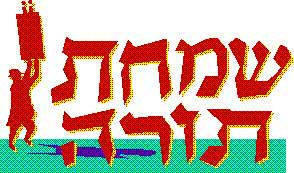 With Him came the fulfillment of that law that is found in the Torah. Through Him we not only read the law but live the law and are credited with its righteousness. Jesus is the ultimate Simchat Torah, because He is the word made flesh. In Him, the cycle of reading only the Old Testament truly does come to an end. Since the New Testament fulfills the Messianic promise of the Old Testament, what better reason could one have for a celebration? Some consider this holiday a type of prophetic fulfillment of Isaiah 2:3. Others believe that this passage will be completely fulfilled during Messiah's millennial kingdom. Talk about the time frame of the last book written. You may be able to get on a one year reading schedule of the Old Testament with them. That may be an opportunity for you to compare, when appropriate, the New Testament where the teachings are the same. An example of this would be when Abraham's faith is credited to him as righteousness and his good works follow as a byproduct of that faith. In Daniel, when the times of Jacob's trouble is mentioned, you may be able to introduce the tribulation period. This is the same seven year time frame but a different name. You may also be able to introduce your last book, the Book of Revelation. The reference to being written in the Book of life may lead to an interesting conversation. It is always good to spend some time rejoicing over God's word. 1) The Feast of Israel by Bruce Scott of Friends of Israel ministries. 3) The Family Treasury of Jewish Holidays by Malka Drucker. 4). Ed Frampton, General Director, The Everlasting Nation.